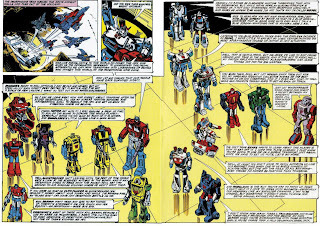 As you may or may not already know, Transformers began as a Japanese toy lines called Microman and Diaclone. Hasbro, still drunk off the success of their G.I. 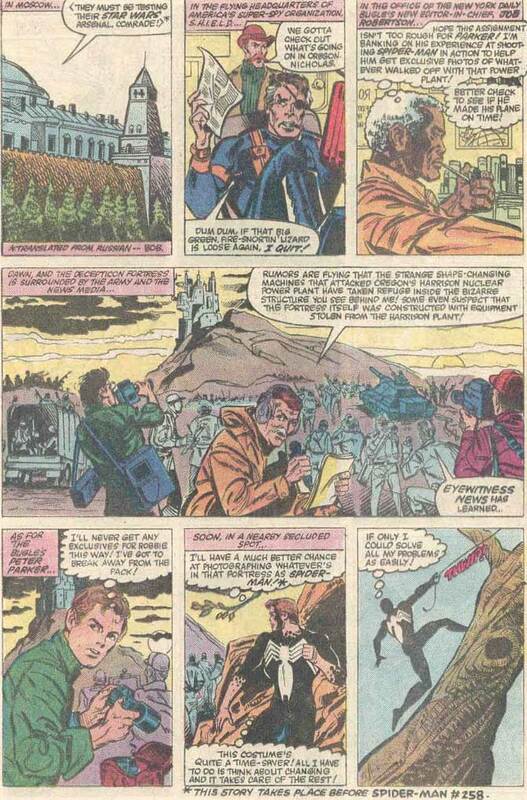 Joe line, bought the toys, and then hired Marvel Comics to create a backstory. 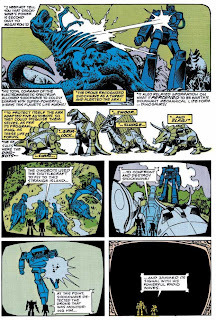 (Unknown to me at the time, Marvel was shaping my young entertainment life long before I even realized it). 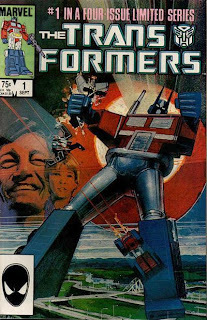 Jim Shooter and Denny O'Neil were instrumental in the development of the Transformers story, and Bob Budiansky is credited with creating most of the Transformers characters and names. 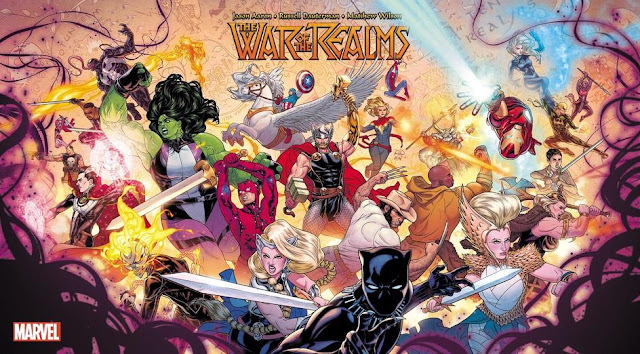 A four-issue Marvel comic book mini-series was created, as well as an animated TV series. The basic foundation of the conflict was the same in both, but the characters and ongoing storylines varied, sometimes drastically. (Anytime anyone tries to say comic books are too complicated for a young child to try and figure out, just remember that I had absolutely no problem realizing that the comic and TV show were two completely different things. It was never a problem). Now, I have no problem telling anyone that I think the cartoon is still solid animated entertainment to this day, but the comic book was always a little bit edgier, a little more sophisticated. (I don't want to use the term "darker" because that's such a clichéd word, but that's probably accurate. But to keep it in context, I'm saying it's darker than a half hour syndicated animated cartoon. So, work with that). So, without further ado, let's do this thing. Far away in the Alpha Centauri galaxy, is the planet Cybertron. A robotic planet populated by robotic beings that can change shape and form. 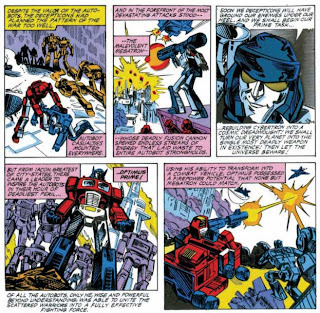 The peaceful Autobots were the primary residents of the planet, until a malevolent being named Megatron organized an army of Decepticons to take over the planet. Civil war breaks out, eventually throwing Cybertron out of its orbit and hurtling through the universe. 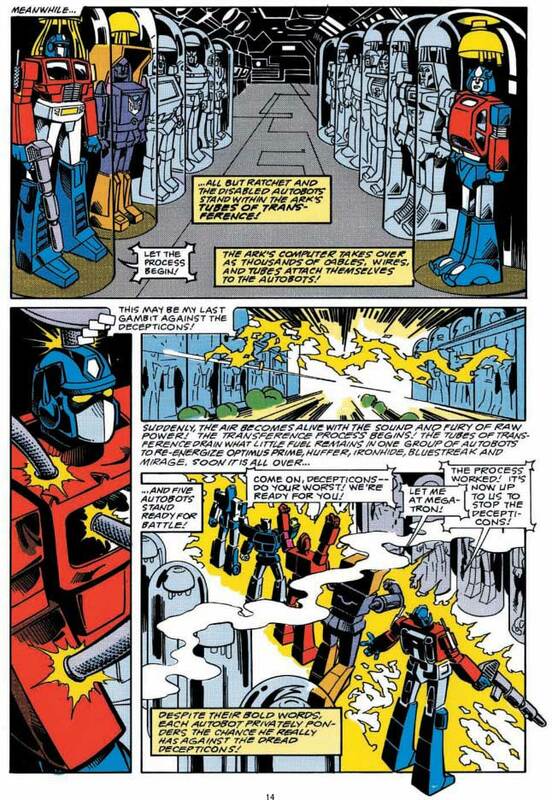 From the city capitol of Iacon, a heroic warrior named Optimus Prime emerges, to lead the Autobots. 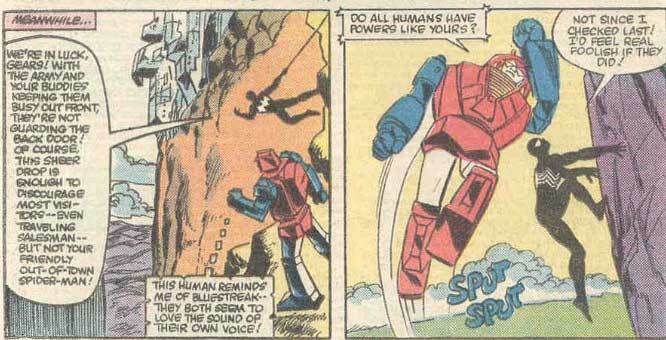 (I was always fascinated by his Cybertonian alternate mode depicted here). Cybertron eventually heads towards a giant asteroid field. Optimus Prime and a team of Autobots volunteer to take a ship out to clear a path through the asteroids. 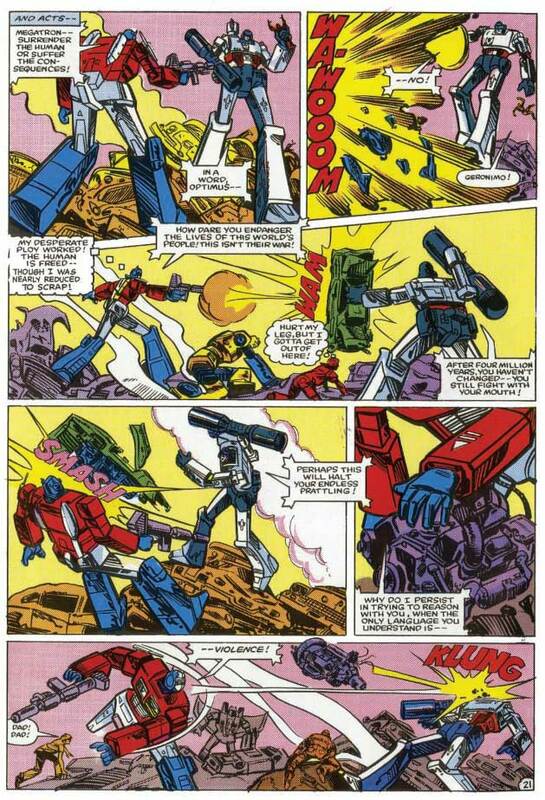 Megatron obviously learns of this plan, and intends to ambush the Autobots while they do this. (This is where the cartoon and the comic begin to diverge. 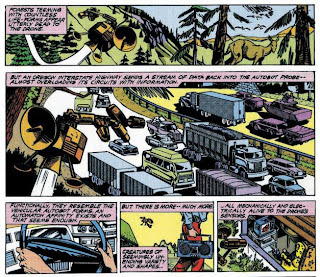 In the cartoon, the Autobots go out in search of life-sustaining energy). The Autobots complete their mission, and then the Decepticons attack. Optimus Prime sends their ship, The Ark, on a suicide dive into a nearby planet, hoping to take out the Decepticons once and for all. The ship crashes into the side of a mountain, and everything lays dormant for 4 million years. Obviously the mountain is on Earth, and a probe is awakened in the year 1984. (Pretty much the same as the cartoon). The robot drone goes out to capture the likenesses of what it believes to be the local life forms. Cars, planes, tape decks, and anything else that matches its needs. It returns to the Ark and begins to rebuild and revive the Autobots and Decepticons, regardless of affiliation. 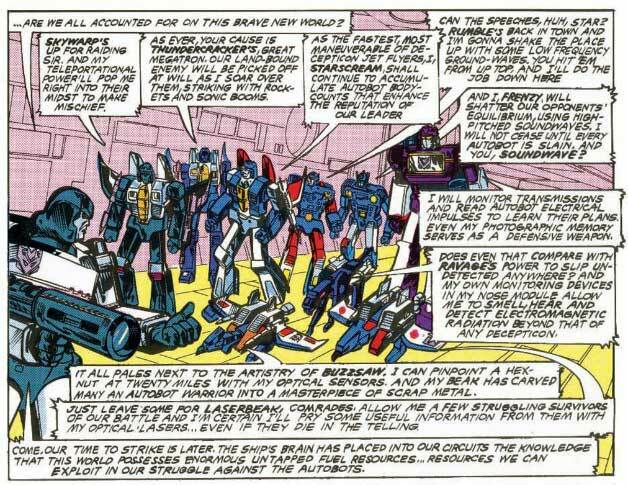 The Decepticons do a roll call, introducing the reader to all the characters, depicted on this page. 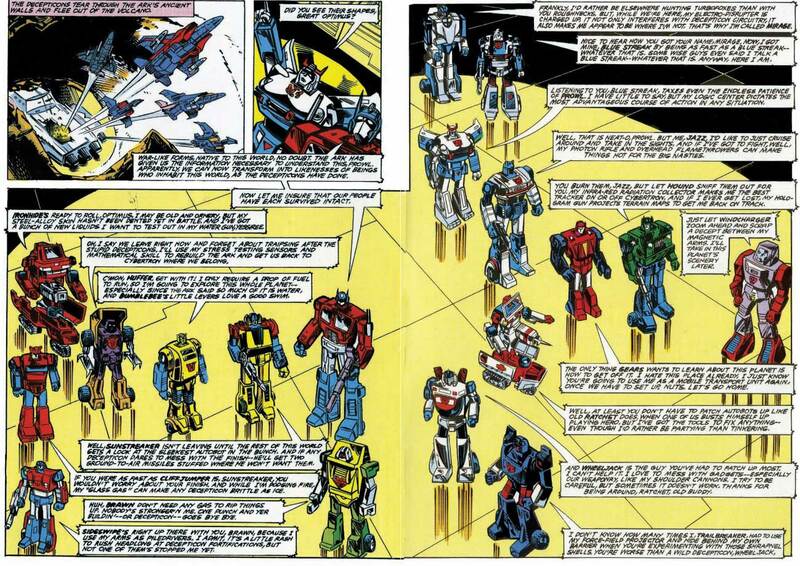 The Autobots also do a roll call, introducing all their members. 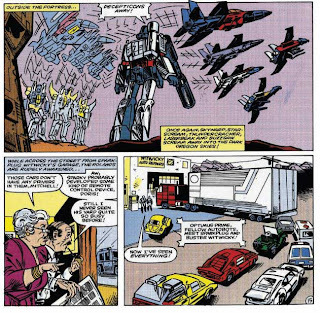 The Decepticons flee, to plot nefarious things. 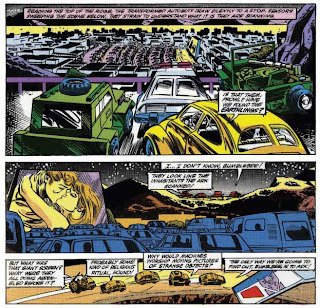 The Autobots stay behind, and try to learn as much as they can about the alien world they have landed on. 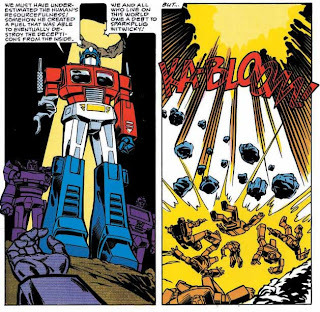 (I've always loved the silhouette of the Autobots in this panel). Next, we meet Buster and Sparkplug Witwicky. Buster will be the key human character for much of this early run of the series. The standard conflict between the blue-collar father and the studious son is established here, before Buster leaves for a drive-in movie. 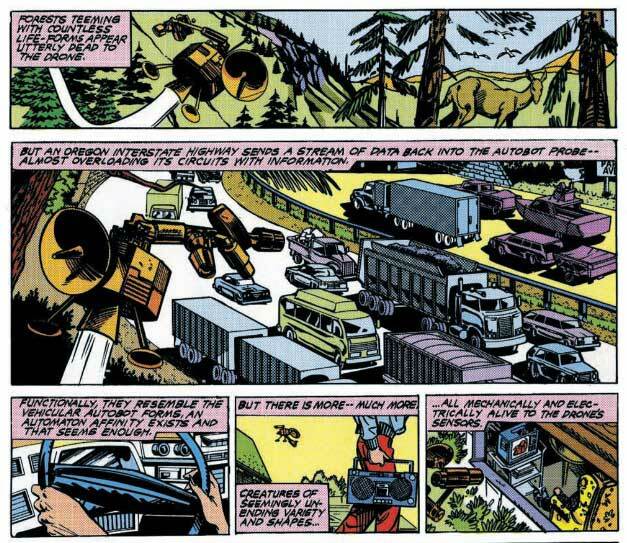 Prowl, Bumblebee, Hound, and Brawn have ventured out into the world to gather information and possibly find fuel. They conveniently happen upon the same drive-in movie that Buster is attending. (I always kind of wondered what movie everyone is watching with the two people constantly going at each other on the screen). 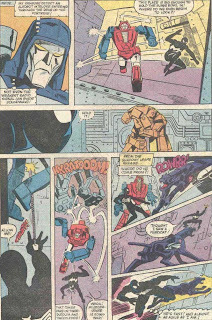 Right at that moment, the Decepticons attack (Ravage is always getting intel for them on the movements and whereabouts of the Autobots), hitting Bumblebee pretty good in the process. 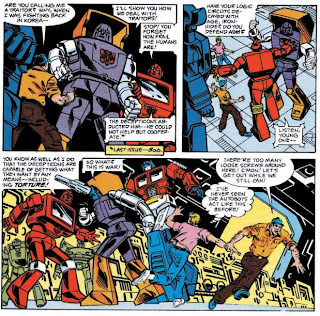 The Autobots choose to reveal themselves by transforming, so they can fight back. 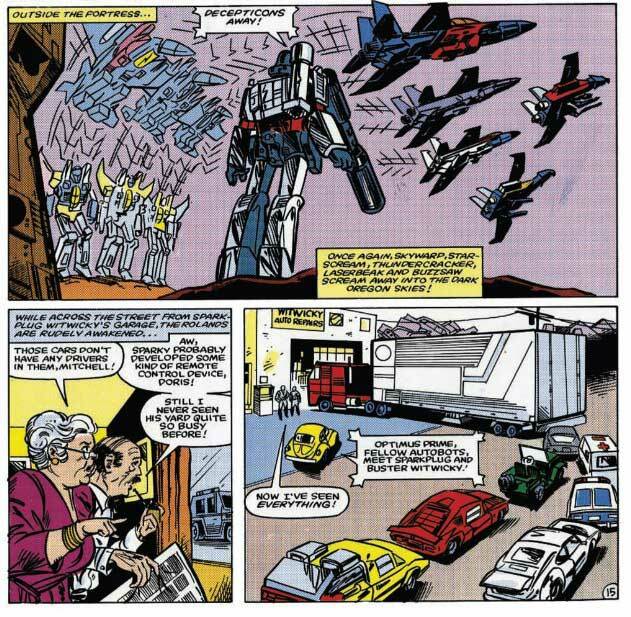 Prowl notices the human beings fleeing, and deduces that they must be the living inhabitants of the Earth, not the vehicles. Prowl decides to retreat, to inform Optimus Prime of this new information, leaving the damaged Bumblebee behind. 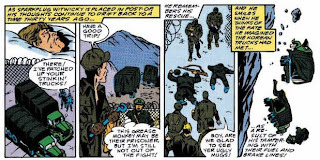 (Way to never leave a soldier behind, Prowl!) Buster gets in and is able to guide Bumblebee home, wondering the whole time what is going on. 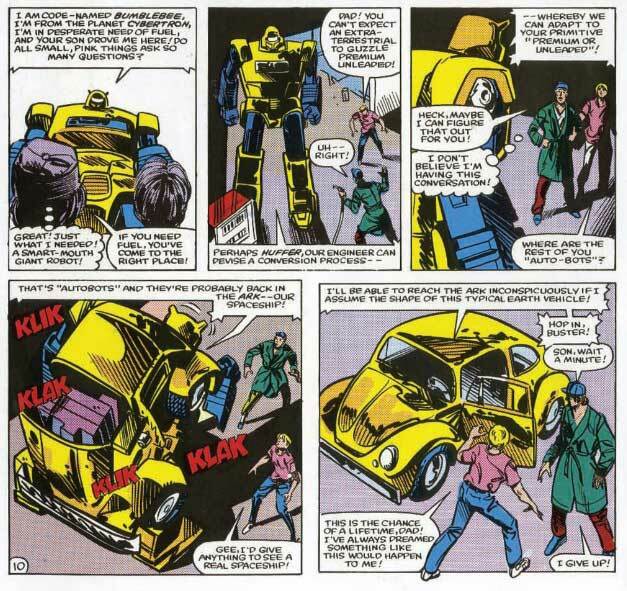 Sparkplug arrives home to find Buster in the garage trying to fix Bumblebee himself. Initially pleased that Buster is working on a car, he's eventually shocked when the car talks to them and asks for help. 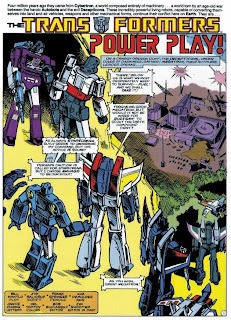 My brain thoughts: One thing I always noticed as a kid, and that you may have noticed, is that the designs of the Transformers are very heavily based on the actual toys themselves, instead of the animated series designs they would eventually use later. 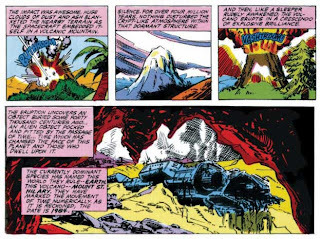 The designs used here, together with the rougher-looking art, give the comic almost more of a science fiction feel. Everything's happening at night, on winding mountain roads, or drive-in movie theatres in the middle of nowhere. It's a much different feel from the obviously more brightly colored animated series. 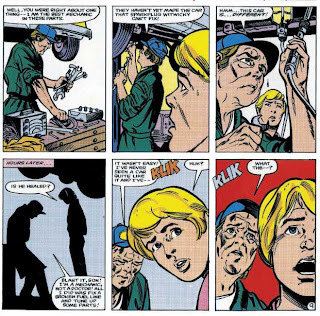 The primary human character in the comic is Buster, instead of Spike in the animated series. Sparkplug is noticeably different than his animated counterpart as well. Another key difference in the comic that we'll come to see is that the human population doesn't understand any difference between Autobot and Decepticon. To them, they're all giant metal robots that want to kill them all. Buster's girlfriend Jessie is kinda comic book hot. 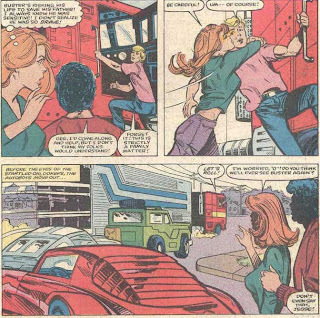 (The name Jessie always remind me of Jessie Spano from the immortal TV series Saved by the Bell, another staple of preteen Back Issue Ben's life). 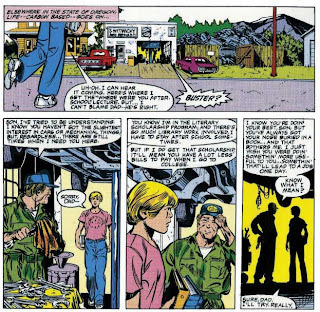 Once again, I discover that Bill Mantlo was somewhat involved in everything I've ever loved in my entire life. (I kind of suspect Mantlo may have been involved in my conception somehow. I think even if he was just there as an observer, taking notes, he contributed something). 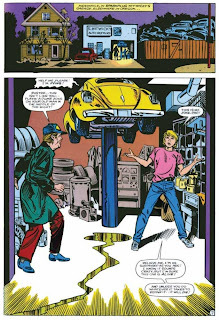 Back in the Witwicky garage, Sparkplug refuses to believe that a car just talked to him. 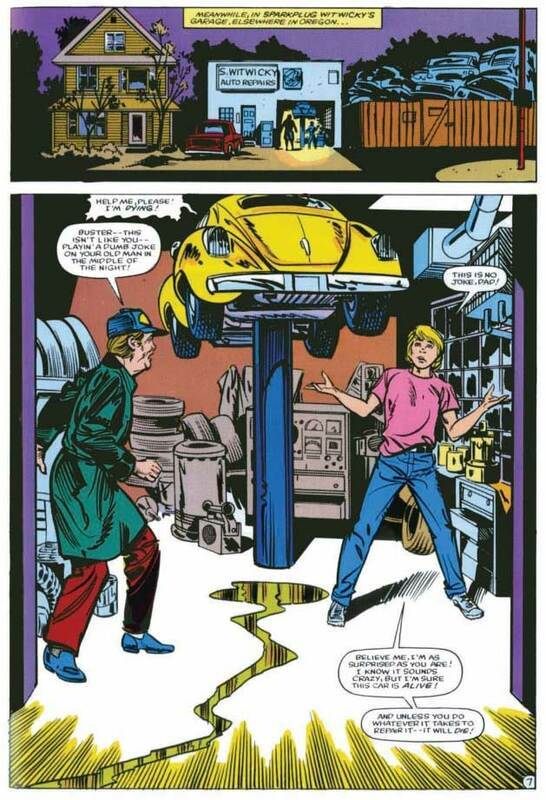 After Buster pleads with him, Sparkplug finally agrees to try and fix the car, and he immediately notices that it is indeed different. Successfully fixing him, Sparkplug is shocked to see Bumblebee transform, validating Buster's wild claims. He inadvertently volunteers to see if he can convert Earth fuel for use by the Autobots. 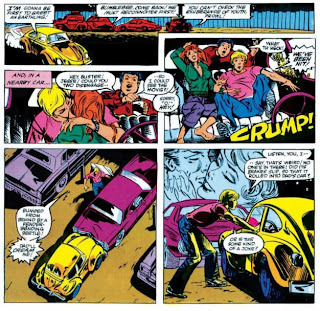 Buster and Bumblebee depart to inform Optimus Prime of these developments. Coincidentally enough, they run across Jessie and O, with Ravage spying on their plans to have Sparkplug assist them in converting fuel. 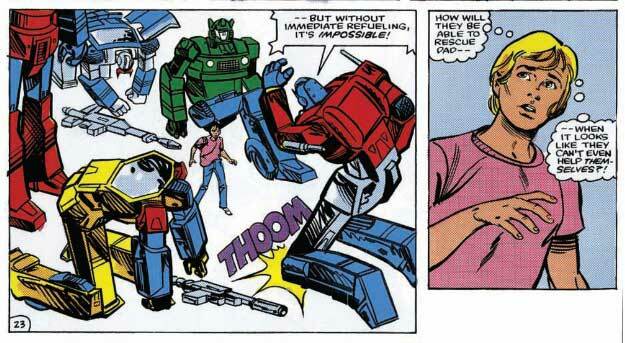 Bumblebee radios Prime with the news (Continuity alert! Weren't they just driving back to the Ark?) and the Autobots roll out for the Witwicky residence. The Decepticons do the same. 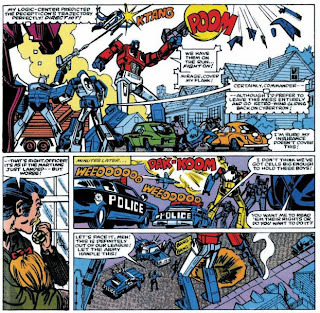 The Autobots arrive, only to be almost immediately attacked by the Decepticons. 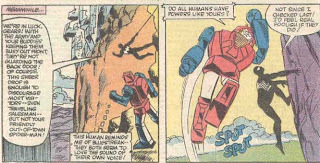 Megatron makes his move for Sparkplug. Thud! Poor Bumblebee got clocked. 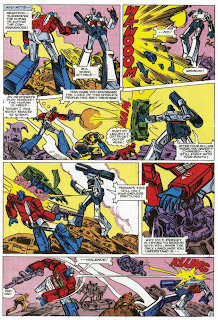 Optimus Prime and Megatron face off for the first time in this series. 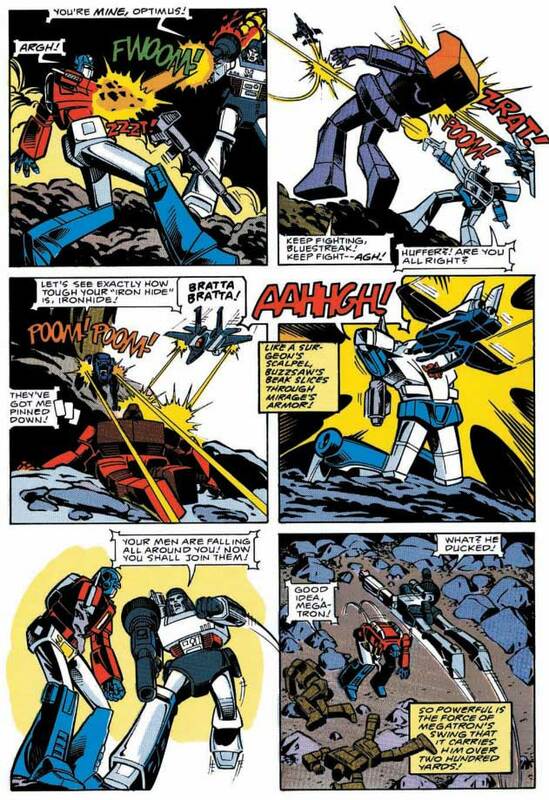 Starscream is able to get away with Sparkplug, and the Decepticons retreat, having gotten what they came for. 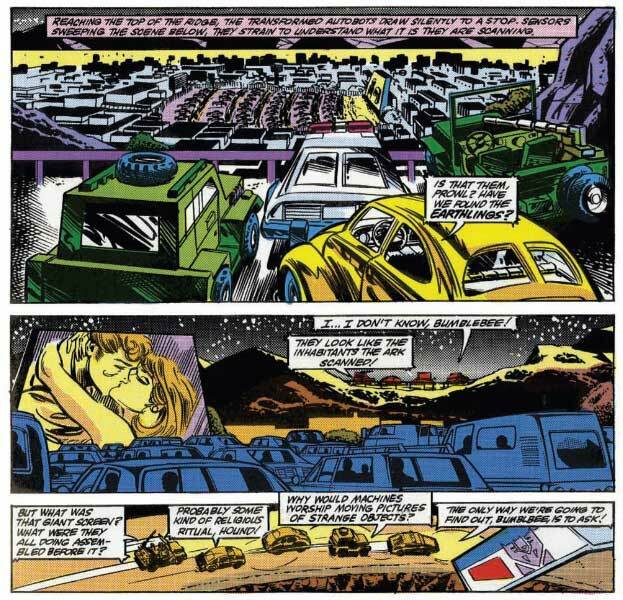 As they leave, the Autobots collapse, apparently suffering from lack of fuel. 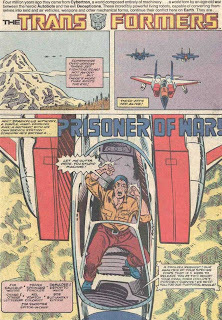 Sparkplug, captive of the Decepticons, is taken back to their ginormous tower headquarters. 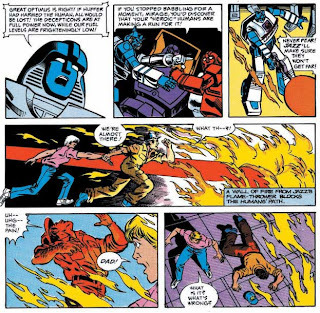 Megatron orders him to convert fuel for use by the Decepticons. 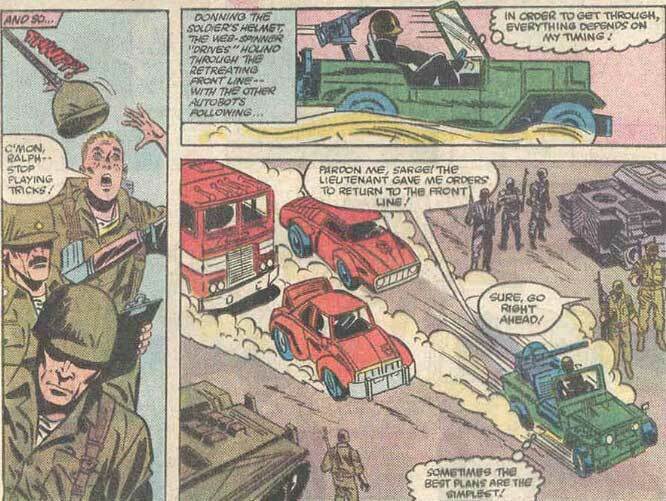 Sparkplug reverts to his Army training from Korea, by reciting name, rank, and serial number. Back at the Witwicky garage, the Autobots take turns apologizing for the kidnapping of Sparkplug. Finally they get around to deciding to go after him. Buster's girlfriend Jessie is stacked. 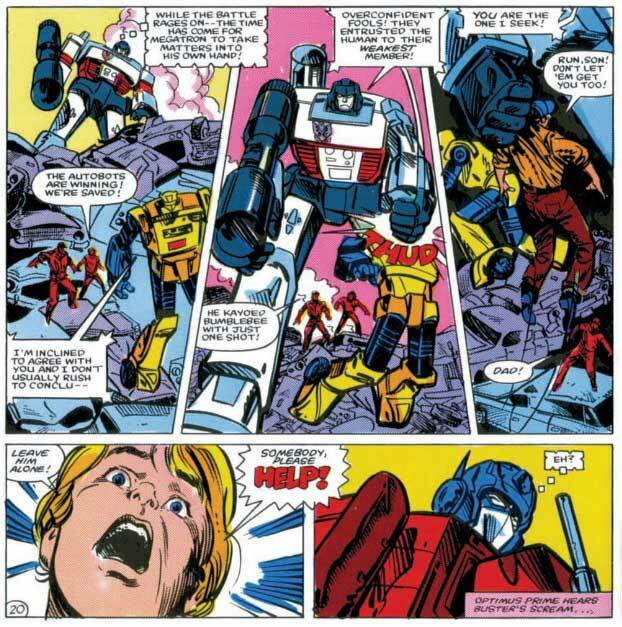 They return to the Ark, where Ratchet attempts to inform Prime about something he found in the Ark's memory banks, but is interrupted. Sparkplug is effectively persuaded to work for the Decepticons. 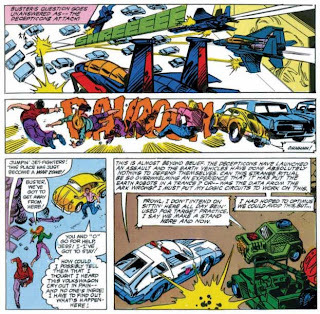 Peter Parker changes into Spider-Man, and runs across Gears. They very quickly team up when a Decepticon attacks. Spider-Man meets up with the rest of the Autobots, and comes up with a plan to get them past the Army perimeter. it makes no logical sense for it to work. 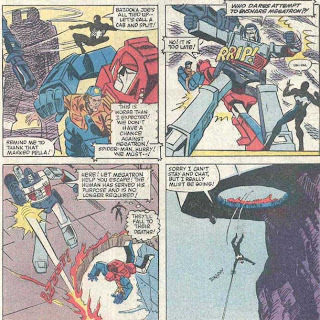 The Autobots battle the Decepticons they run into beyond the perimeter, while Gears and Spider-Man make their way up the back way of the mountain hideout. 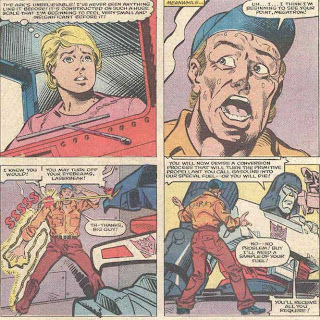 Sparkplug confirms that he succeeded in converting Earth fuel for Transformer use. 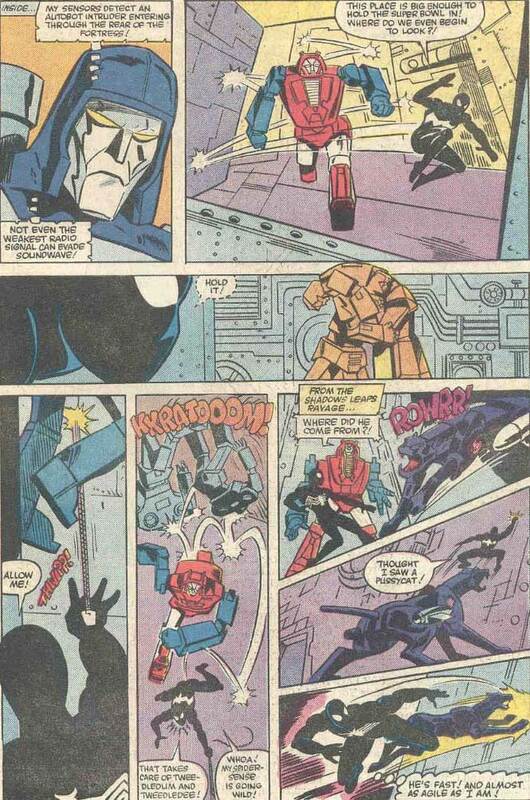 They finally make their way in to save Sparkplug, but leave the hard way when Megatron blows a hole in the floor. 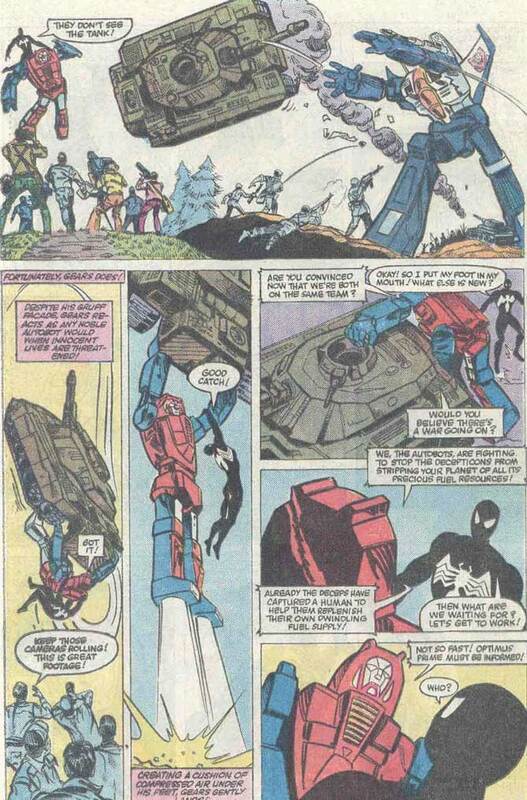 Spider-Man is able to save Sparkplug, but not Gears, and is little bit upset by the "death" of Gears. He is corrected by Optimus Prime, who says that Gears can simply be repaired. Spider-Man departs for his own books. 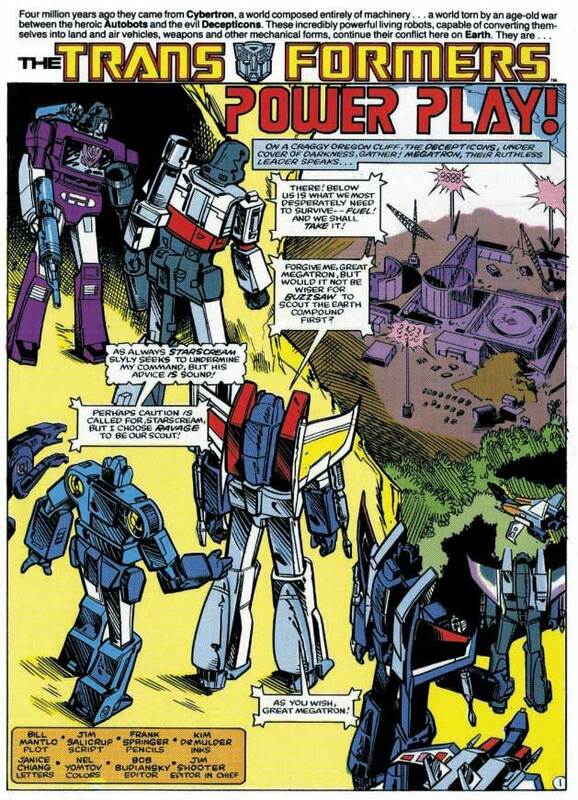 Gears, upon being reactivated, informs the Autobots that Sparkplug gave the Decepticons what they wanted. 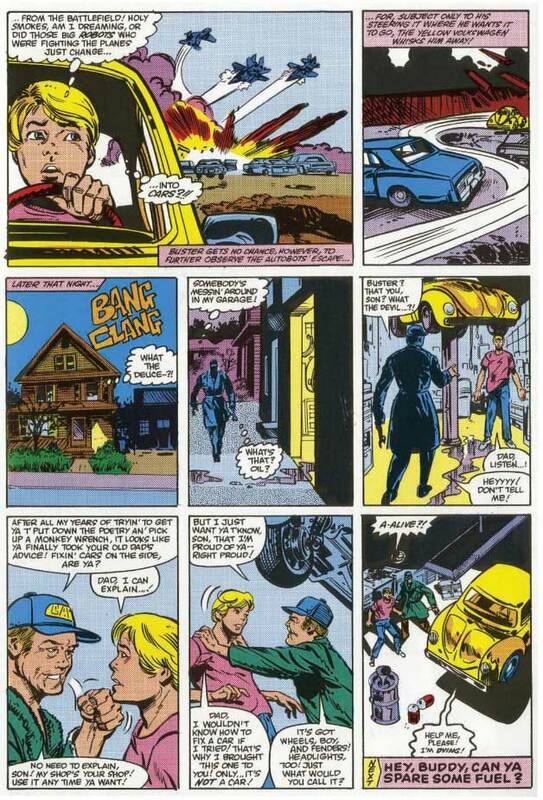 My brain thoughts: In retrospect, using Spider-Man in this comic was a pretty smart move on Marvel's part. G.I. 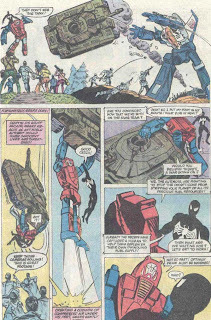 JOE and TRANSFORMERS were, without a doubt, gateway comics for many new, young readers in the 80s, and throwing Spider-Man in one of the books might intrigue some of them to check out his comics. It didn't work on me immediately, from what I remember, but it did work eventually. 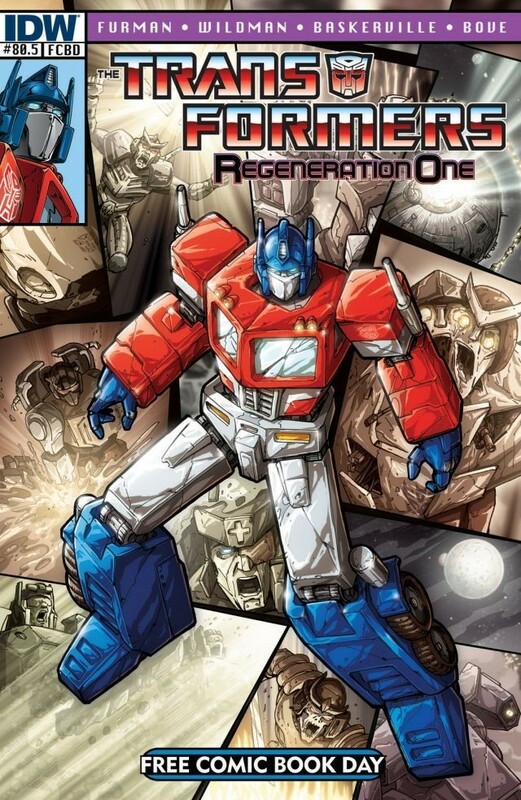 Not so great a move for IDW, who owns the Transformers license now, because they can never reprint issue three in full, only summarize what happens. 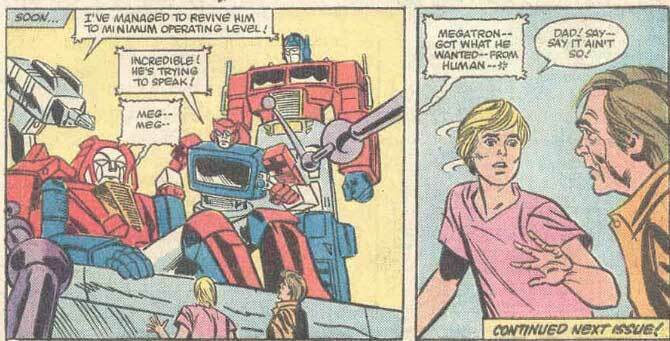 The depictions of the Transformers start to resemble the animated designs a little more as of this issue. 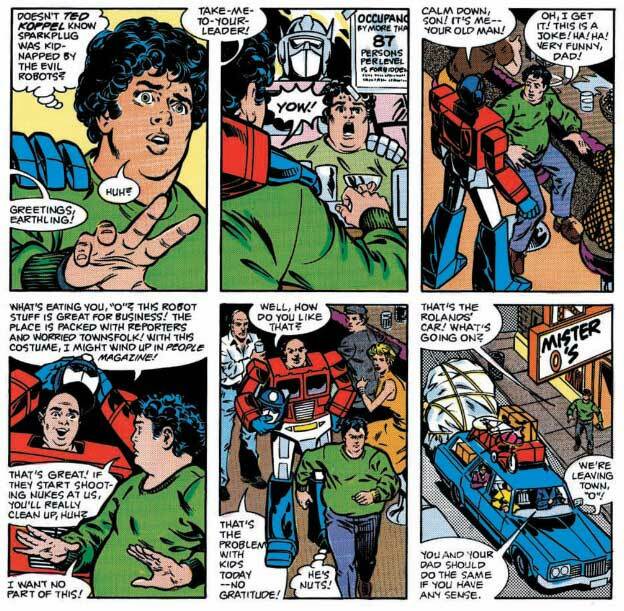 A shocked Buster asks his dad if he really gave in to the Decepticons, while the Autobots argue over Sparkplug's guilt. I remember learning the spelling of the word "cooperate"
from this issue. See parents, comics learn kids stuff! 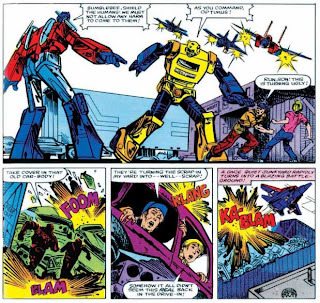 Sparkplug tries to escape with Buster while the Autobots argue. 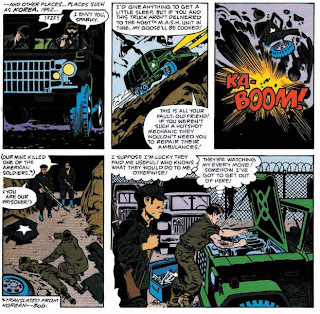 Jazz blocks the escape with a wall of fire, with bad results, as Sparkplug collapses to the ground. Meanwhile, the locals watch the news broadcasts about the Transformers, including Buster's friend O.
costume like this actually existing somewhere. Some comic book hot ballet girls look out the window. This is also where I first heard the phrase "and the kitchen sink." Sparkplug drifts back to memories of his time in Korea, when he was captured and forced to work on North Korean vehicles. Huffer fills in Optimus Prime on the information from the Ark's memory banks that Ratchet mentioned earlier. 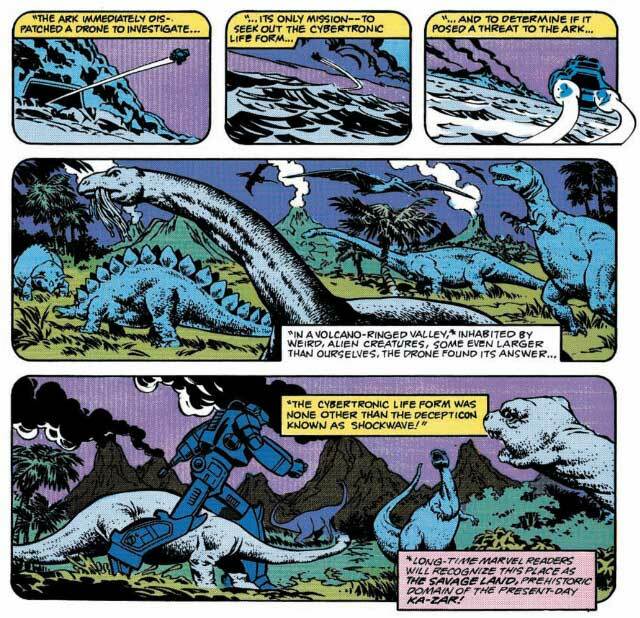 Shortly after the crash, a Decepticon named Shockwave and the Dinobots were seen fighting in the Savage Land. 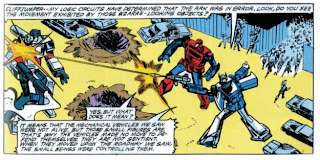 Their whereabouts are unknown as Shockwave saw the probe recording the situation and destroyed it. 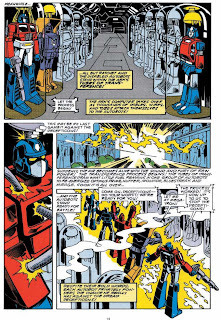 The Autobots have decided to consolidate their energy into five warriors for the upcoming battle. 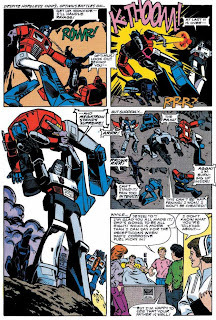 The Autobots are losing the battle, broken and mangled. 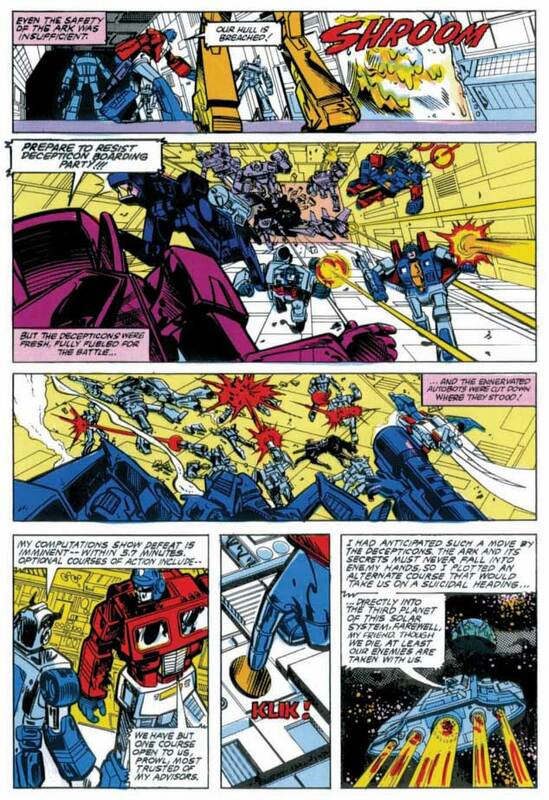 The Decepticons are on the verge of victory, when they suddenly collapse. The Autobots contemplate what happened, and realize that Sparkplug must have tainted the fuel he gave the Decepticons, just like he had done to the North Koreans all those years ago. (See!) 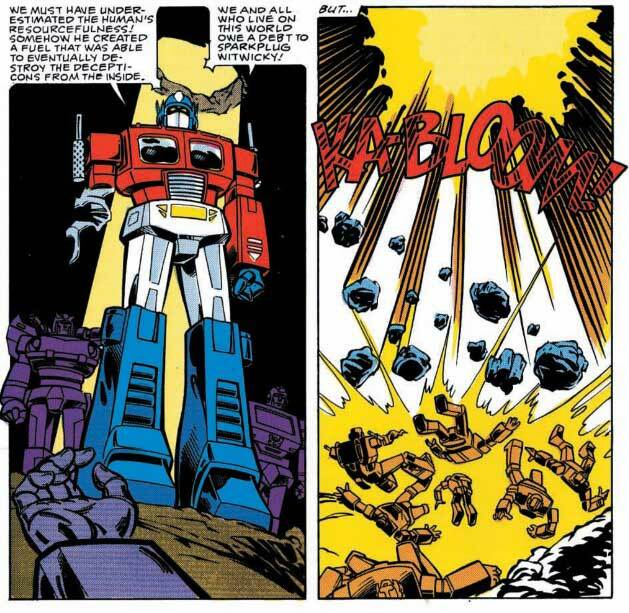 So, right then, at their moment of triumph, a tremendous blast comes down from above, rendering the Autobots inert. This marked the arrival of the villainous Shockwave. 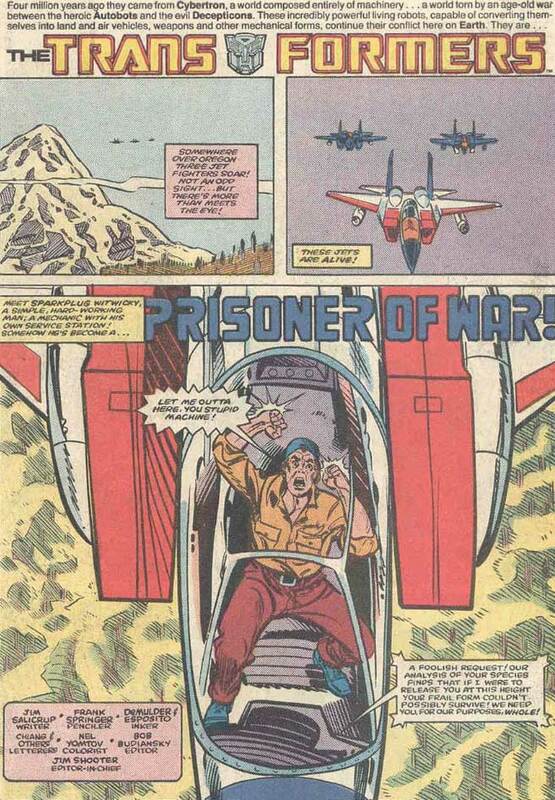 My brain thoughts: The Transformers are full-on in their animated designs by this issue. The big battle at the end was pretty gruesome, as far as big robot battles go. 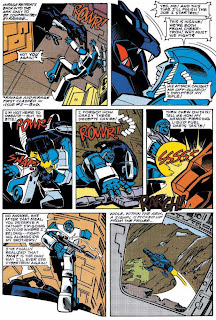 Optimus gets a mangled arm, which kind of intrigued me as a child. A nice little twist is given to the story with Sparkplug's deception (see what I did there?) of the Decepticons. The Dinobots are hinted at, for future stories. (That will be important later as well.) 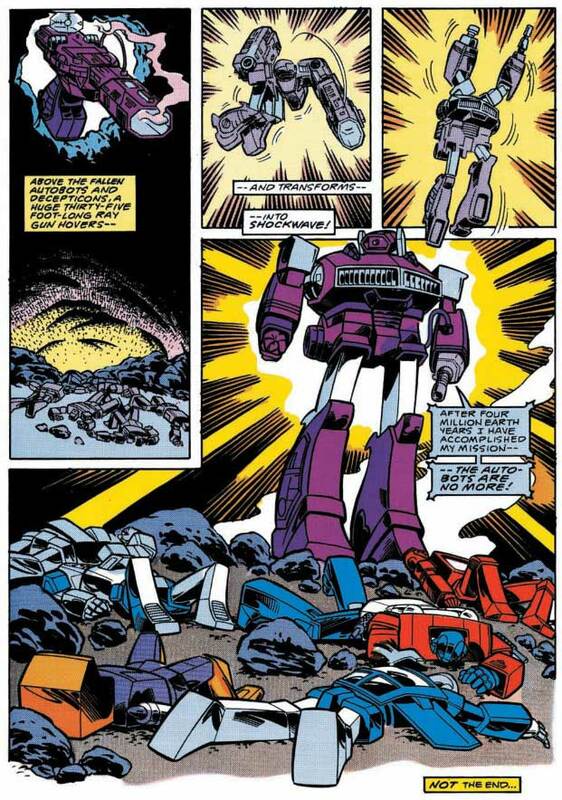 The arrival of Shockwave and his defeat of the Autobots was a shocking moment. Not only did the four-issue miniseries end on a down note; there just wasn't that many times I can remember the Autobots losing so definitively in the cartoon, if there were any at all. 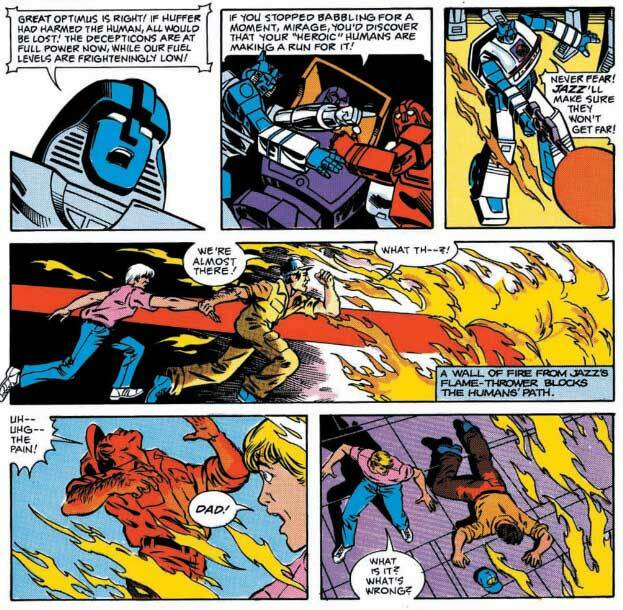 Shockwave would go on to be much more of a key member of the comic series than he ever was in the cartoon. 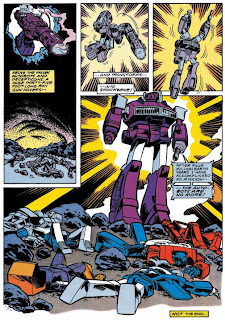 (I remember I had a Shockwave toy as a kid, but not the official Transformers version. 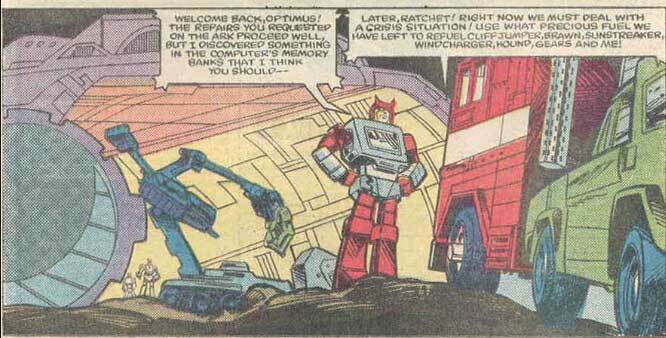 I had a gray Radioshack version that was the exact same toy, just without the Transformers stickers on it.) 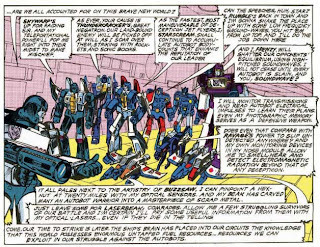 Shockwave was little more than a lackey left in charge of Cybertron in the cartoon, but in the comics, he had a lust for power. My final brain thoughts: So, this was it. 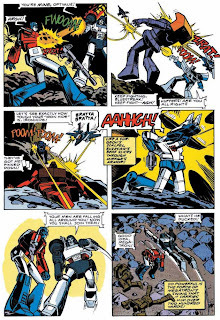 The beginning of the Transformers saga in comic book form. These may not have been the first issues I read as a kid, but I can't imagine it took me very long to find them in back issue form. 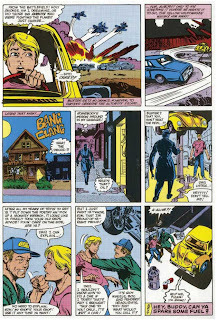 (I know I had these big, not quite treasury-sized, reprints that contained the first six issues I believe, split between two books. I didn't get the individual issues until much later, when I had a full run of the entire series going for a time.) What began as a four-issue limited series would eventually expand out into eighty issues, with several miniseries along the way. One of my favorite things about the series was the ways in which certain characters were depicted as completely different from the animated series. You'll see more of that as we move along. In later years, these original comics, toys, and cartoons would come to be known as Generation One of the Transformers. 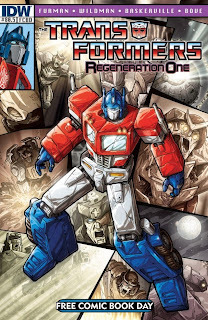 Just this year, IDW has started a series called Regeneration One, which picks up right where the Marvel series ended off, with the same creative team that was working on the end of that series. Check it out. It should be good. That's it for now. Coming up in issue five, we have one of my all-time favorite double page splashes of carnage and destruction ever. You also just might actually end up liking Ratchet. Bonus Back Issue Ben Moment: I recently found a comic book I made when I was 8 years old, dated 12 April 1986. Here you can see my depiction of Ratchet discovering the lifeless Autobots hanging in the Ark. Have I said before how much I love it? Thanks for this. Made my day. I'll never get to own some of the comics you've been posting but you've made them enjoyable by adding some history and happy childhood memories. Kudos!